How does it specifically compare? Total Points = 93 out of 100 Possible. Would you consider for your concealed carry a very well-built 9mm gun, that weighs one pound, is about an inch wide, has fiber optic and tritium night sights, has a comfortable grip in a subcompact design, is single-action only, and is reliable and accurate? 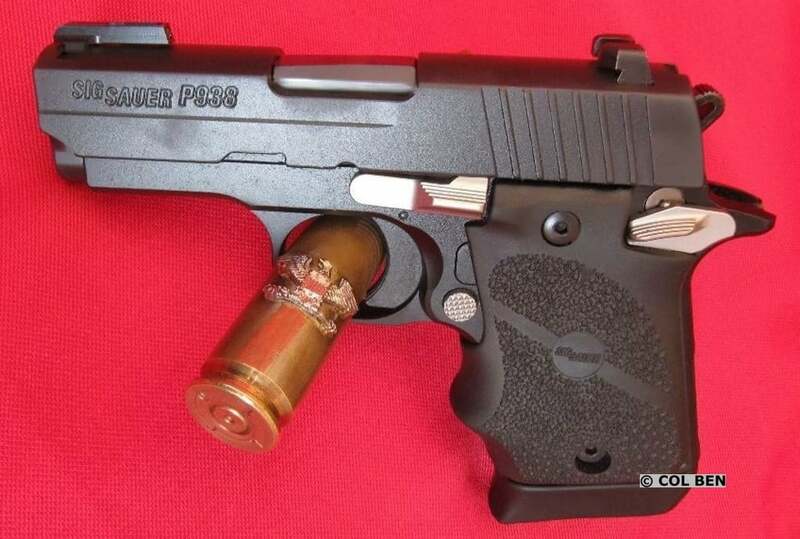 Although it has been around for a few years, some overlook the Sig Sauer P938 9mm pistol either because they think it is just too small and light with much felt recoil, a handgun only for pocket carry or just for women, has a hard trigger press, or else they focus on its brother, the Sig P238 in .380 caliber. The 938 is a slightly larger version of the 238. Well, you owe it to yourself to pay attention to this quality handgun and consider it for your concealed carry handgun inventory. Several folks have decided it is just right for concealed carry and not just in the pocket, so I want to give you some details so you can make your own decision. I want to point out some of its specifications, special features, and give you a thorough analysis of it to help you. Also, I compare the 938 in 9mm to its brother the 238 in .380. As most know, Sig Sauer has a fine reputation for making quality handguns, but what about this single action-single stack subcompact 9? Does this 938 live up to the high Sig Sauer standards? What distinguishes it from the pack? Would you bet your life on it? I want to shoot and evaluate this 938 for myself and give you my opinions and recommendation to help you. My article comparing 14 subcompact 9mms was published on this website earlier and the 938 was one of the 14 subcompact guns listed. In my recent book, “Concealed Carry & Handgun Essentials,” I thoroughly analyze, compare, and rank my Top 21 Concealed Carry guns, including both compact and subcompact 9mm guns, and the 938 is one of the 21 guns. How accurate is it out of the box, without modifications, at various closeup, personal defense distances? Is it a reliable gun without ANY malfunctions or stoppages for my trials? What is its actual trigger press? Is the trigger smooth, light, and crisp? Does it have a short reset distance for follow-up shots, with tactile and audible resets? Does it feel comfortable in my hand and can my wife and I easily reach all controls? Can we handle the felt recoil and muzzle flip, given our individual physical limitations? Does it have quality night sights and/or a fiber optic front sight? Are there any different or unique desirable features for this particular gun? Are there any issues or concerns that would prevent me from carrying this gun? 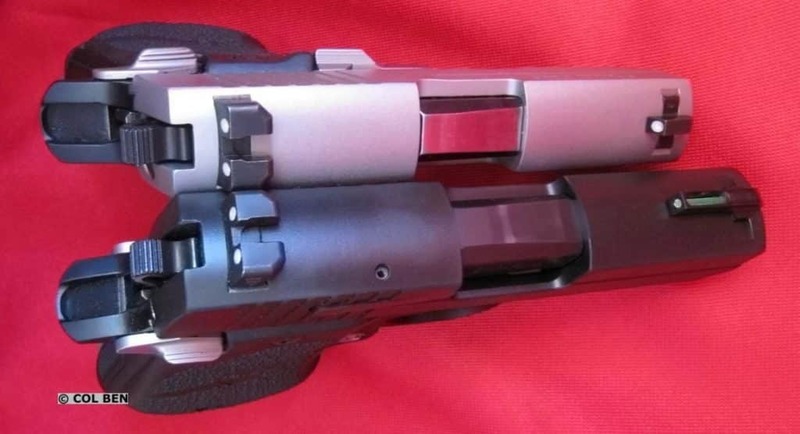 Are there quality holsters readily available now for the 938? Would my wife and/or I actually carry this particular gun in our top 6 concealed carry guns rotation? Would it be best used as a BUG (Backup Gun)? Do I recommend it for your concealed carry consideration? 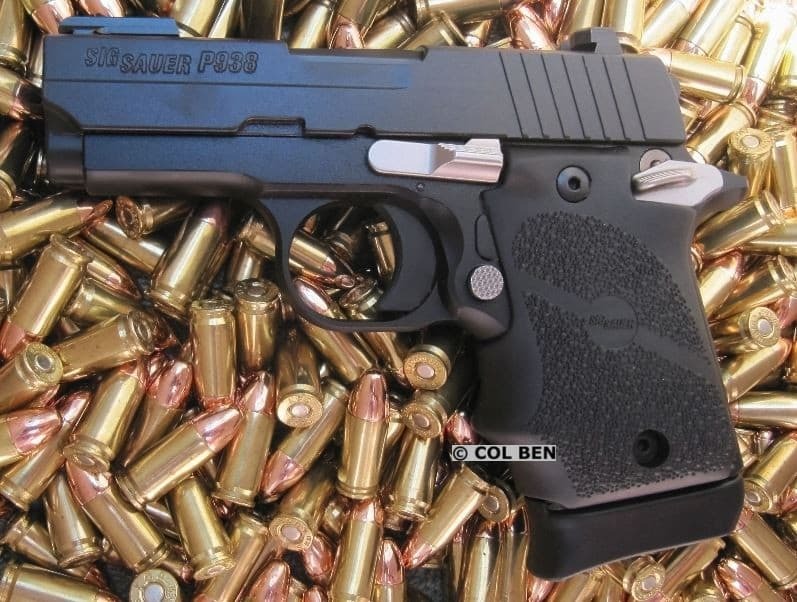 First, I want to give you the specifications and features for the Sig Sauer P938. Next, I list the 10 criteria that I use to evaluate all guns. When you are evaluating your carry guns, determine your goal, purpose, and own criteria, being certain to compare apples with apples and not with oranges, so to speak. Finally, I want to give you my analysis for each of my criteria and present my final recommendation to purchase or not. As always, set your own criteria, identify your purpose, do your own research, compare this gun’s attributes against your criteria, and check my data and information with yours, and shoot it yourself before you buy this or any gun. I wondered if there were available custom holsters and accessories for the Sig Sauer P938? Yes, there are many holsters available for this gun from many manufacturers. Many are custom fitted to it and made from various materials, kydex, various leathers, hybrids, etc. They are made for pocket, IWB, and OWB carry and prices range from about $30. to about $200. generally. 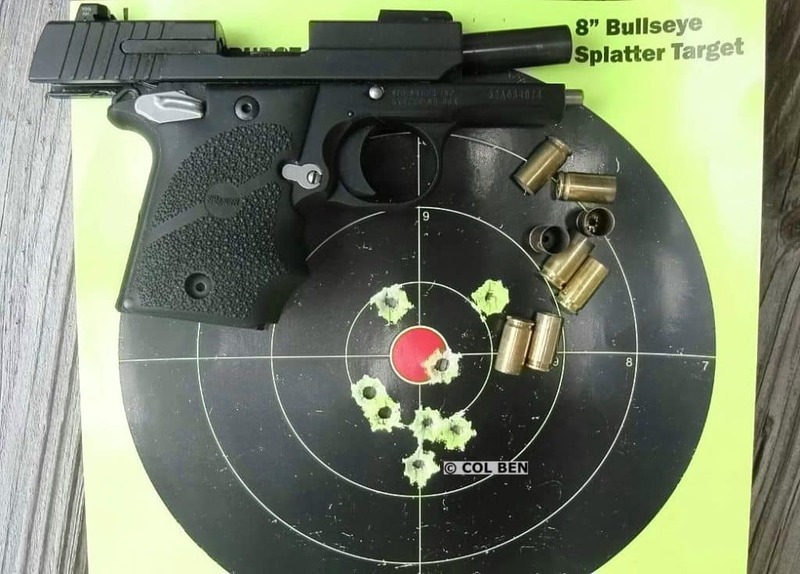 Here are just 10 of my criteria and factors I use for evaluating any handgun, so I will use them for the P938. In addition to my criteria, there are other subjective features that may be appealing for some, like a certain style, mag release location, action, caliber, appearance, number of mags included, type of sights/modifications, bore axis, rail, grip angle, non-porting or porting, included extras like a holster and pouch, customer service, etc. So, I combined these into my last Miscellaneous criterion. I must admit that ALL gun-choice decisions involve tradeoffs, but I really want ALL of my criteria to be met. I assigned a total possible point score of 10 points for each of my 10 criteria for a total possible score of 100 points. You can certainly add your own additional criteria and preferences or subtract any of mine. Recognize that there are several features, characteristics, pros and cons, and personal criteria to include and consider and you make your own tradeoffs according to your priorities, preferences, defined needs, and use. I was anxious to shoot the 938 and shot about 250 rounds for the range field test. I shot various high-quality Sig Sauer V-Crown 115 grain JHP (1185 fps Muzzle Velocity, 359 ft lbs Muzzle Energy), Sig Sauer Elite Performance 115 grain FMJ (1185 fps Muzzle Velocity, 359 fl lbs Muzzle Energy), CCI Blazer Brass 124 grain FMJ (1090 fps Muzzle Velocity, 327 ft lbs Muzzle Energy), and Speer Lawman 115 grain TMJ (1200 fps Muzzle Velocity, 368 ft lbs Muzzle Energy) ammo. Shooting all of this various ammo really gave me a feel for how the 938 could handle different ammo grains and types. Usually, I shoot 500 rounds over a couple of days to decide if I want to carry the gun or not, but I had the information I needed after shooting about 250 rounds. I will shoot more to confirm my initial evaluations. Below are my evaluations for each of my 10 criteria for my concealed carry purpose. I put the gun through its paces and checked it thoroughly for malfunctions and performance with different types of JHP and FMJ ammo. Thanks to Sig Sauer for providing their rounds to test and evaluate this Sig Sauer P938 Sub-Compact 9mm pistol. I bought the other ammo myself. The moment I picked up this gun, its solid high-quality feel was evident. The usual Sig fit, finish, and tight machined parts were there. While this gun’s Nitron-coated slide and black, hardcoat anodized frame were not exactly beautiful, they serve the purpose for durability and sturdy practicality. Of course, there are 9 other versions with different features and options, if you want to pay for them, including such things as stainless or two-tone slides, nickel accents, Rosewood grips, various grip styles, Flat Dark Earth color, different sights, etc. I was expecting heavy felt recoil from this subcompact 3-inch barreled handgun, but I was pleasantly surprised. I could handle the felt recoil well and so could my wife. I believe the rubber wraparound grips, the stainless steel slide, aluminum-alloy metal frame, and its single action combined to help a lot to offset the recoil. The 938 felt really good in my hands, like a miniature version of my 1911s. In fact, that is the design it is (sans grip safety), with its single action trigger, external thumb safeties, beavertail, tilting barrel, thin grips, etc. This gun is well designed with fine ergonomics. Like 1911s, it has a nice grip angle, a deep beavertail, comfortable (rubber) thin grips, nice fiber optic front, and rear night sight. The SIGLITE Tritium night sight dovetails into the slide. The rear sight was large enough and had a flat front ledge, so if necessary you could manipulate the slide one-handed by hooking the sight. The manual safeties are ambidextrous and have a very definite, solid tactile click when engaging them. I like this quality, easy and natural downward manipulation operation and there is little chance of accidentally engaging the safety. The safety and the magazine release button are located similarly to 1911s and function well. In my package, there are two mags: a flush-fitting, stainless steel 6 round and a 7-round steel mag with an extended base plate. I like the 7 rounder because my pinky finger does not dangle and gives me a solid and comfortable 3-finger grip, along with the extra round. The 938 trigger was slightly curved, was serrated just right, and rested in an undercut trigger guard for easy concealed carry. The trigger was not too aggressive serrated and did not irritate or cut my trigger finger. It was not like an original 1911 straight-back trigger in that the 938’s trigger is hinged at the top. You can see the pin on both sides just below the slide stop lever and takedown pin, similar to other modern triggers, like some striker-fired ones. This gun was easy to takedown. You pull the slide back until the disassembly notch lines up with the slide stop properly, push the slide stop out of the frame, and then remove the slide. It is similar to a 1911 takedown, but there are differences. One challenging and unique thing I noted during reassembly, was dealing with the ejector. There is no channel in the slide for the spring-loaded ejector. It is very important when reassembling and putting the slide on that you push forward and down on the ejector so that it goes just SLIGHTLY down and below the back of the slide. When the slide clears and goes over the ejector, the ejector then will spring back up solidly into position. I mastered this after just a couple of practices. But, note the CAUTION is to NOT push the ejector down too far. This is the only field strip quirk and not a problem after just a little practice. The 938 was accurate for its size, lightweight, and short-length barrel. Understand that the 938 is not a precision target gun, nor duty gun, nor a competition gun. It is a small, very concealable, lightweight, short-barreled subcompact concealed carry gun for up-close personal protection. I did not expect it to perform like my other long-barreled, very heavy, compact and full-sized guns. But, I was surprised at how well it did shoot and perform, given its diminutive dimensions and specifications. I found the 938 to be accurate enough for close up, combat tactical encounters. It had a short reset, great ergonomics, and was for me a reliable (with only 250 rounds fired by me) self-defense gun. The trigger was longer and harder, but manageable, than I wanted and expected in a miniature 1911-like single-action gun. This is the really only significant downside to this concealed carry gun. This gun appears to be very reliable. All the mags did drop freely for me. I did not experience any malfunction or stoppages with the 250 rounds fired. The felt recoil and muzzle rise of this subcompact 9mm were mild and manageable for me. It did not have a magazine disconnect and it fired even when the mag was out. Be careful– Safety First Always! My first 8 rounds fired with the 938 rapid fire at only 3 yards were decent, not great, hits. I must keep telling myself that this is a subcompact concealed carry gun with a short sight radius and is intended for very close, “bad breath” distance encounters. It may very well serve as my BUG. But, it does well and is so easily concealable, comfortable to hold and carry, and lightweight that it may occasionally serve as my primary carry gun. Below are my 8 hits at 3 yards with the 938. The accuracy of the 938 was acceptable and fine for me at distances of 3, 5, and 7 yards, but marginal at 10 and 15 yards and beyond, given my aging eyesight and average shooting skills. My groups at the closeup distances of 3, 5, and 7 yards averaged a respectable about 2.5 inches. While at 10, 15, 20, and 25 yards it averaged about… I hate to say it… 3.5 to 4.00 inches with this light, subcompact pistol with a 3-inch barrel. But, it is not designed to be a tack driver at 25 yards. The 7.3-7.5 pound trigger press was longer and harder than I am accustomed to with my full-size and compact 1911s and my striker-fired guns. I prefer the press to be in the ballpark of 4.5 to 6.0 pounds. And this gun was lightweight at 18 ounces loaded with a short sight radius, which affects accuracy. But, the trigger press was smooth and crisp with a decent, easily identifiable reset. It was comfortable and the recoil was controllable for me. I used my Modified-Isosceles Stance, a two-handed grip, and the center-mass sight picture. I shot mostly premium Sig Sauer V-Crown JHP and FMJ ammo, with some Blazer 124 grain FMJ and Lawman 115 grain TMJ. The gun was not picky and digested it all. The nice beavertail allowed me to grip the gun high on the backstrap to help control it. The trigger press averaged 7.3 pounds with 8 readings from my Lyman Electronic Trigger Pull Gauge. This is not acceptable to me, although it is for some folks. 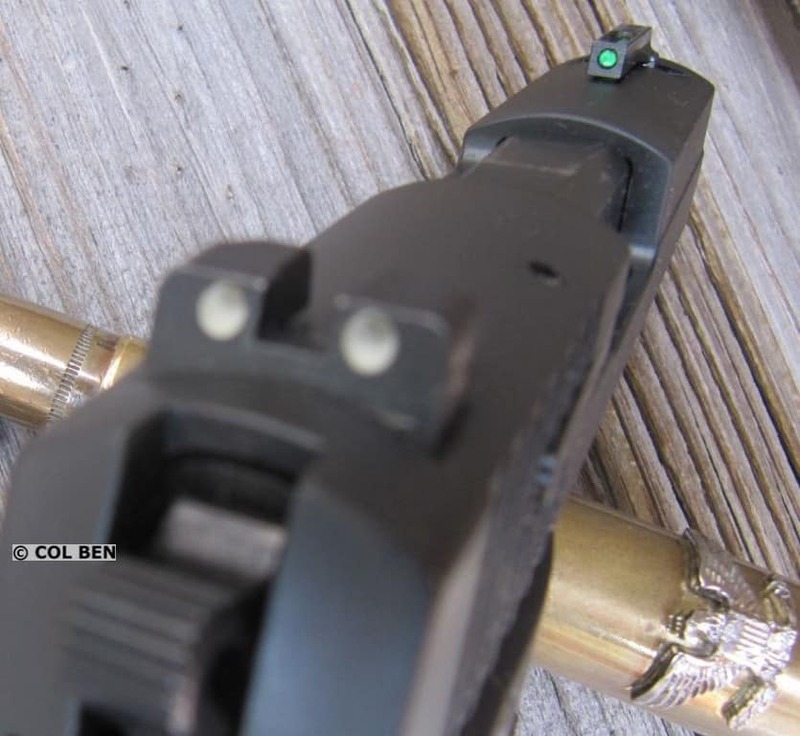 Some prefer a little heavier trigger for added safety, but I believe this is a training issue for your particular gun. Again, I like my 1911 single-action and striker-fired semis with a lighter press. I did notice near the 250 rounds-fired point that the trigger was a little softer. So, it will probably improve some. I will use this gun primarily as a BUG, so this is fine for that purpose. I’ll just have to practice more with it. Of course, this is personal preference and a training issue. The trigger press was very smooth and crisp. The trigger had a definite audible click and a tactile feel with no creep and no stacking. It had a consistent and short reset. I really liked the short and positive reset and the crisp trigger. There was no grit at all and the reset was very recognizable. The trigger face, although a curved trigger, has slight serrations and an almost flat face, which felt very good and allowed fast follow-up shots. The 3.0-inch barrel with the subcompact’s 16 ounce weight and 4.2″ sight radius were a challenge for me. But, I keep reminding myself that this is a concealed carry gun which needs to be small and very concealable. It is not meant to be a precise long-distance tack driver, but rather a close-up self-defense gun, probably mostly a BUG. I was able to control the recoil and muzzle flip, but not exactly as I wanted. The barrel was high quality helped me control muzzle flip and the felt recoil. The hammer-forged steel barrel was durable, had a tight fit, was of high quality, and performed well. The fiber optic front sight and rear night sights were crisp and excellent. I had no trouble seeing them at dusk or at nighttime. I conducted my usual test of putting the gun in my completely dark closet and I could see the front and rear sights very clearly, after just a minute of light exposure. This was better than some other sights I have reviewed. These sights surpassed my expectations and I was very pleased with their performance. The overall 16 ounce unloaded weight was very light, but the ergonomics, grip, beavertail, and sights more than offset the lightweight to help performance. And the weight made it perfect and easy for concealed carry. I gripped the gun very tightly and concentrated on the front sight to get decent hits up close. Really, overall it was not too light a gun for carry and for accuracy, so I will carry it probably as a BUG. Incidentally, my wife really likes it and it will be one of her top 3 carry guns. I prefer the 9mm caliber, used with appropriate ammo with the right ballistics and grain weight. So, it was easy and natural for me to shoot the 9mm caliber. 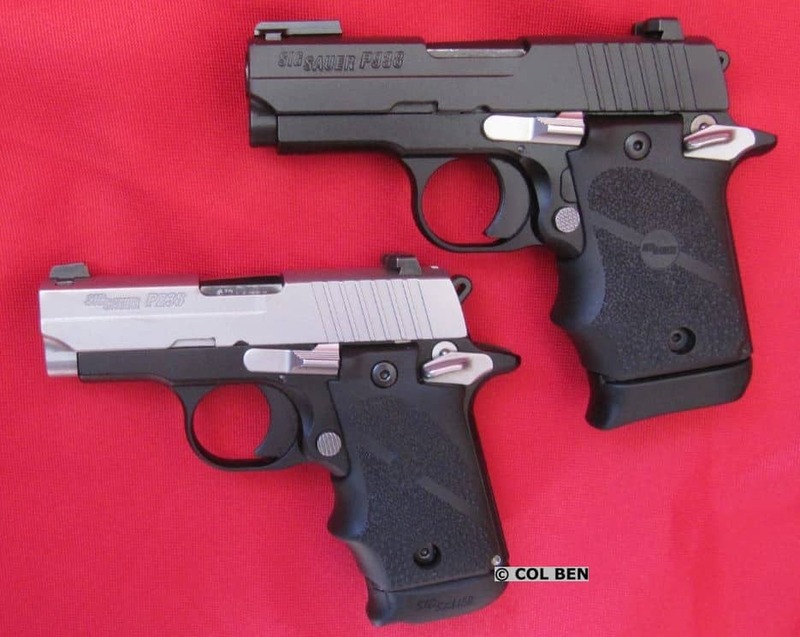 The 938 in 9mm and the 238 in .380 caliber both are nice lightweight and quality carry guns. They are very comparable in dimensions, as you can see from the above image. My wife likes to sometimes carry the 238 for a quick trip to the store but prefers the 9mm. Only two single-stack steel magazines were included and this is always a concern for me. But, there was a 7-round extended mag with a pinky extension that I really like and was easy to carry. Also, there was included a 6-round flat, flush-fit mag. As always, I want 3 mags to be included, to save from having additional expenditures and as a minimal necessity. This extra mag costs about $33. The standard capacity of 7 for the extended mag was better than other smaller guns like this, several holding only 6. Wish a third magazine with an extended base for 7 rounds was included. The mags were high quality and made of metal with witness holes. My medium-sized hands were comfortable with the mags. Overall, the ergonomics of the 938 subcompact were excellent. I really like its rubber grip and the way it feels in my hands. It did not slip in my hands and my grip was firm and very comfortable. I liked this miniature 1911 and its similar 1911-like manual of arms. The ambidextrous safety and the overall high-quality build were evident. The 938’s lightweight and rounded corners really help its concealability. This is a reliable gun and I did not have any malfunctions. The slide lock lever, safety, and mag release button were all easy to quickly locate and operate. There are no front serrations which is fine with me. It has a skeletonized hammer. ALL mags did drop freely and quickly. The ergonomic features of this Sports 13 Sig 938 helped minimize my felt recoil. As always before shooting any new gun, I disassembled, lubed, cleaned, and re-assembled the 938 before I shot it. I did not have to press the trigger to disassemble it and it was very easy and quick to take apart. A little like the standard 1911, but there are differences. (Remember, do your SAFETY check to ensure any gun is unloaded before disassembly.) I had a concern initially about reassembling the 938 since I had to be careful with the ejector and had to practice pushing it down just right. When reassembling, the hook-like ejector must be depressed just SLIGHTLY. Just enough to provide clearance for the slide. If you depress the ejector too far, it will cause it to bind in the frame and the ejector will not return to its usual position and cause a malfunction. IMPORTANT, so please note this if you buy one. This is a high quality and solidly-built gun which is fitted very tightly. The price of the gun is reasonable for the quality and features you get. It comes with a hard lockable case, owner’s manual, cable lock, and two mags. It does not include accessories like some have, e.g. a holster, mag pouch, loader or other accessories… or the third mag. There are several nice features for this very quality subcompact, all metal, single action gun. It has a firing pin block safety, ambidextrous manual safeties, and no grip safety. There is not a magazine disconnect safety, so it will fire with the mag out. There is a Lifetime Limited warranty. I certainly RECOMMEND this handgun for consideration as a concealed carry gun and/or a backup gun (BUG.) Its reliability, lightweight of a pound unloaded, narrow width of 1.1 inches, high-quality all metal build and tight slide to frame fit, excellent fiber optic front sight and rear night sights, comfortable rubber grip, nice trigger with short reset, and overall ergonomics are fine for me. While the trigger press is a little harder and longer than I prefer in my single-action triggers, it certainly is acceptable and practice with it will improve my learning curve. The beavertail helps with a high and solid grip and control. The recoil is manageable and expected for a short-barreled and lightweight concealed carry gun. There are several holsters available for the gun. The 938 Sports 13 model is in my wife’s top 3 carry guns and also in my top 6 carry guns. I hope this review of the Sig Sauer P938 subcompact 1911-like 9mm pistol has helped you gain some information you did not previously have. Consider that these are just my opinions with limited live-range fire and shooting myself only about 250 rounds of ammo. Like always, I recommend that you shoot any handgun yourself before you purchase it. Decide on your criteria, how you will primarily use the gun, and what features are important to you and you are willing to pay for ahead of your range time. Then critically evaluate the gun YOURSELF per your criteria and purpose, with standard drills (several mentioned in my book), with various ammo types and brands, over an extended break-in period of about 500 rounds. Remember, Safety First Always! * This personal opinion article is meant for general information & educational purposes only and the author strongly recommends that you seek counsel from an attorney for legal advice and your own personal certified weapons trainer for proper guidance about shooting & using YOUR firearms, self-defense and concealed carry. It should not be relied upon as accurate for all shooters & the author assumes no responsibility for anyone’s use of the information and shall not be liable for any improper or incorrect use of the information or any damages or injuries incurred whatsoever. © 2017 Col Benjamin Findley. All Rights Reserved. This article may not be reprinted or reproduced in whole or in part by mechanical means, photocopying, electronic reproduction, scanning, or any other means without prior written permission. For copyright information, contact Col Ben Findley at [email protected].